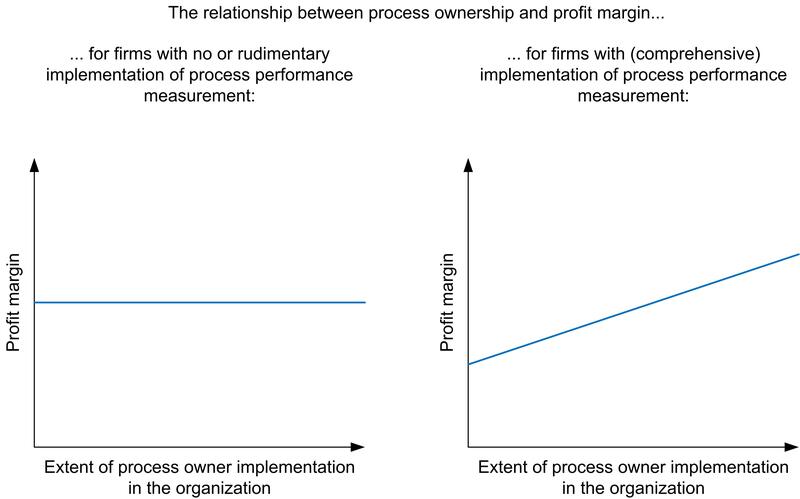 This article briefly summarizes the study “The Effects of Process-Oriented Organizational Design on Firm Performance”, by M. Kohlbacher and H. A. Reijers, which will be published in the Business Process Management Journal. The study investigates which process management components (i.e. process design and documentation, management commitment towards process management, process ownership, process performance measurement, corporate culture in line with the process approach, application of continuous process improvement methodologies, and organizational structure in line with the process approach) are important for improving customer satisfaction, product quality, time-to-market speed, delivery speed, delivery reliability, and financial performance. process performance measurement is important for improving product quality. a process-oriented organizational structure is important for improving time-to-market speed. a culture in line with the process approach is important for improving customer satisfaction, delivery speed, delivery reliability, and financial firm performance. The paper will be published in the next issue of the Business Process Management Journal (Vol. 19, No. 2, 2013). This article introduces the study “The Joint Impact of Process Ownership and Continuous Process Improvement on Financial Performance and Customer Satisfaction” by D. Weitlaner, M. Kohlbacher and A. Kamagaew, which will be presented at the IEEE International Conference on Industrial Engineering and Engineering Management in Hong Kong in December 2012. The study is nominated for the best paper award. The process owner role and continuous process improvement are two key components of business process orientation. The article investigates whether the implementation of these two concepts can improve the firms’ financial performance and customer satisfaction. The study is based on data from 840 Austrian manufacturing and service companies. The empirical evidence indicates that organizations that implement both concepts – process ownership and continuous process improvement – reap the fruits of process management in terms of higher financial performance and customer satisfaction. The paper will be available via IEEE Xplore after the conference. The poster of the study can be found here. This article briefly summarizes the study “The Effects of Process Orientation on Exploitative and Explorative Innovation”, by D. Weitlaner and M. Kohlbacher, which will be presented at the 32nd Annual International Conference of the Strategic Management Society, which will take place in Prague, October 7-9, 2012. The presentation of the paper will take place in Track I, Session 239, on the 9th of October (see session details). The study investigates how individual components of process orientation (i.e. continuous process improvement, corporate culture in line with the process approach, management commitment towards the process program, the process owner role, process performance measurement as well as process knowledge and documentation) affect explorative and exploitative innovation. Exploitative innovations (or incremental innovations) refer to small-scale improvements and adjustments of existing goods/services of a company. In contrast, explorative innovations represent entirely new goods/services which are not inferred from the existing supply of a company. The empirical study involves 840 Austrian enterprises operating in the manufacturing or service industry. The empirical findings reveal that continuous process improvement and a culture that is in line with the process approach are significantly and positively associated with both types of innovation. The empirical evidence also shows that a narrow focus on detailed process documentation may actually be cumbersome to explorative innovation. This article summarizes the study “Process Ownership, Process Performance Measurement and Firm Performance” by Kohlbacher M. and Gruenwald S., to be published in the International Journal of Productivity and Performance Management, Vol. 60, Issue 7, 2011. Process performance measurement and the process owner role are two key components of business process orientation. The article investigates whether the implementation of process owners and process performance measurement can improve firm performance. The study was conducted with 132 randomly selected manufacturing companies in Austria. For every firm one executive (CEO, CIO or quality manager) was interviewed. Is a process owner assigned to each business process? Are process owners experienced managers/leaders? Are process owners responsible for continuous improvement of their processes and do they perform this task proactively? Are performance indicators defined for business processes? Are process performance indicators derived from enterprise goals and/or from (internal) customer requirements? Are improvement actions actually initiated if poor process performance is encountered? In approx. 35% of the firms, both process performance measurement and process owners are virtually absent. Approx. 26% of the interviewed firms implemented process owners in their organization, but do not or only sparely measure the performance of their business processes. Approx. 4% of the organizations implemented process performance measurement, but have no or only a rudimental implementation of the process owner role. Finally, approx. 36% of the firms have both process performance measurement and process owners in place. The left illustration applies for firms with no or rudimentary implementation of process performance measurement. These firms apparently cannot profit from establishing process owners. The right illustration applies for firms which (comprehensively) implemented the concept of process performance measurement. It can be said that those firms benefit from establishing the process owner role in their organization.